Horse stall kits | For support post horse stall construction by Country Mfg. Galvanized Horse Stall Kits Sale Special! Toll Free: 1-800-335-1880 Office Hours Monday-Friday 7:00 am - 5:00 pm EST. HUGE SAVINGS on Feeders, Waterers & Tack Room Accessories if Ordered WITH HORSE STALLS! Call 1-800-335-1880 For More Information on this Discount Offer! Build or convert your stalls into a professional show barn with easy to install, economical, and rugged grill and door panels. 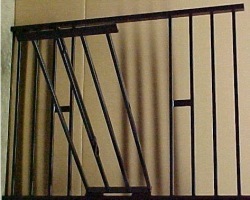 Each panel includes a 4 ft. long channel at the top and bottom welded to 34 inch long heavy gauge 5/8" square vertical bars on 4 inch centers. The door frame is constructed identically and measures 4 ft. wide by 7 ft. high. 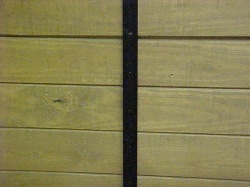 Vertical side channels allow standard 2 inch lumber (1 1/2 inch thick) to be slid into place and bolted at the bottom. A top board cavity is available for supporting sliding door hangers. Using the 4 ft. sections, any size horse stalls can be built (8ft, 10 ft, 12 ft). Also, odd sizes can easily be cut with a standard hacksaw. Example: a 12 ft. stall front would require 2 each 4 ft. sections and 1 each 4 x 7 door frame. Removable side horse stall walls can be made using our 7 ft. long wall channel designed to accept standard 2 inch lumber (1 1/2 inch thick). 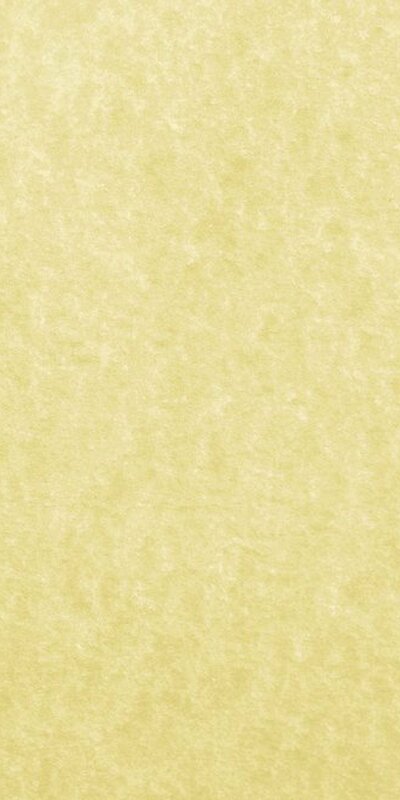 Great For Making Foaling Stalls! 1 ea CM80 Standard Grill Same as 12 ft. except hack saw 1 ea CM80 to 2 ft. 2 ea CM83 Wall Channels for each partition. 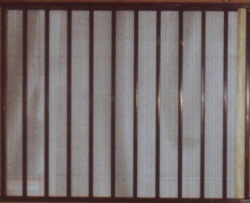 1 ea CM82 Grill with Opening or CM80 Standard Grill Use CM80 for ventilated partitions. 1 ea. CM81 Door Frame Assembly (Use 3 Units for 12' Wall). 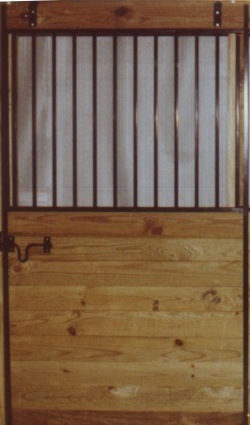 Horse Stall Door- 4ft wide x 7ft high CM 81 SD (steel framework only, lumber not included) 4 ft. long channel at the top and bottom of the grill welded to 34 inch long heavy gauge 5/8 square vertical bars on 4 inch centers. Horse Stall Grill - 4ft wide x 34in high CM 80. 4 ft. long channel at the top and bottom of the grill welded to 34 inch long heavy gauge 5/8 square vertical bars on 4 inch centers. 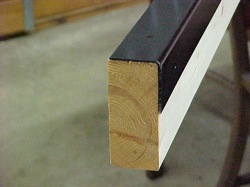 Top and bottom channels are designed to accept standard 2 inch lumber (1 1/2 inch thick). 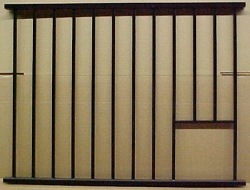 Horse Stall Grill - 4ft wide x 34in high CM 82. 4 ft. long channel at the top and bottom of the grill welded to 34 inch long heavy gauge 5/8 square vertical bars on 4 inch centers. 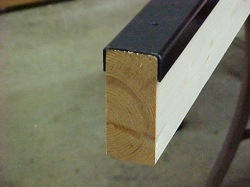 Top and bottom channels are designed to accept standard 2 inch lumber (1 1/2 inch thick). This grill has a feed opening measuring 10" x 10". 7 ft. long wall channel CM83. Removable side stall walls can be made using our 7 ft. long wall channel designed to accept standard 2 inch lumber (1 1/2 inch thick). 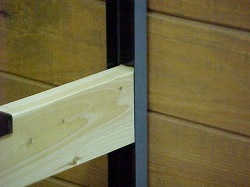 Attach the wall channels to your support posts or walls and slide the lumber into the channels. Measures 7 ft. long x 1 3/4" wide x 1" deep. 8 ft. long steel edge protector CM88. (angle steel) Stops destructive chewing on wood. Measures 8 ft. long x 1 1/2" wide both directions. 8 ft. long steel wall cap CM89. (channel steel) Stops destructive chewing on wood and gives your stall a finished look by capping the edges of the lumber. Fits over standard dimensional cut lumber. Will slide inside of our wall channels CM83 for a great appearance where the wall channel and wall cap come together. Window Grills to your specification. Covers grills up to 34in x 48in. Angle iron top and bottom for attachment to your window frames. Horse Stall Sliding Door Hardware Kit CM 84. Consists of door brackets, bottom stay roller assembly, polyethylene roller system for long life and 8 ft section of enclosed-top track to keep dust and material from falling into the rollers and jamming your door. 7 ft long x 1 1/2 inches wide. Pre-drilled holes every 5 inches. Other stall accessories available in our feeder and waterer sections.